Signed picture of Liverpool footballer Jimmy Case. 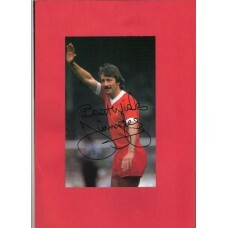 Home » Signed picture of Liverpool footballer Jimmy Case. Bargain item: This is a large postcard size, full length action picture of former Liverpool footballer Jimmy Case. This picture is from a football album of the time and has a really nice example of a Jimmy Case autograph signed in black marker pen. Jimmy Case played 186 league games for Liverpool between 1973 and 1981, scoring 23 goals.